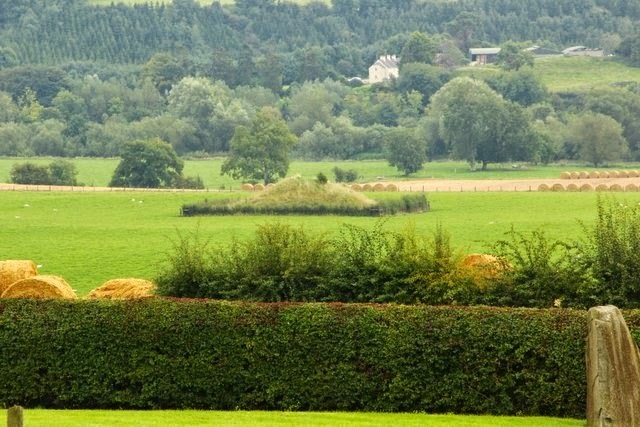 Newgrange was one of my last stops during my visit to Ireland....and it was definitely the most ancient. 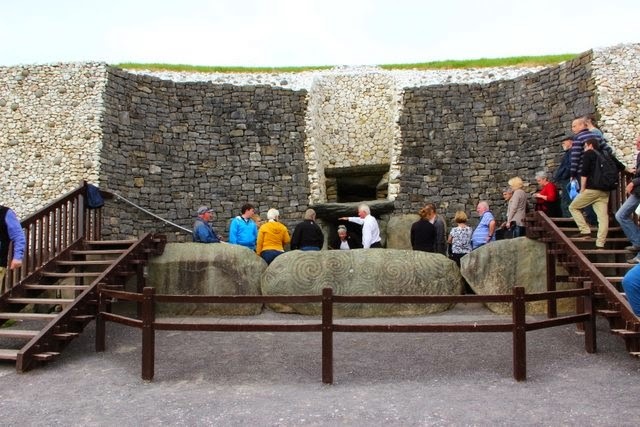 This huge passage burial tomb was built in the late Neolithic period around 3200 BC, making it older than both the pyramids of Giza and Stonehenge! And even more remarkably, it's only one of several other burial sites in the area. 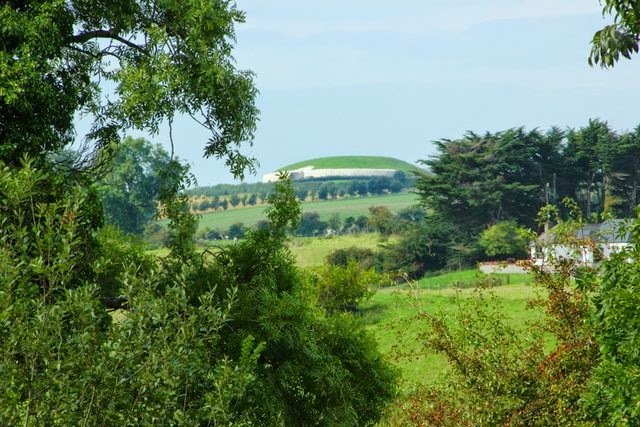 Two other passage tombs, Knowth and Douth share its location, as well as other smaller burial mounds, standing stone sites, and ritual spots. 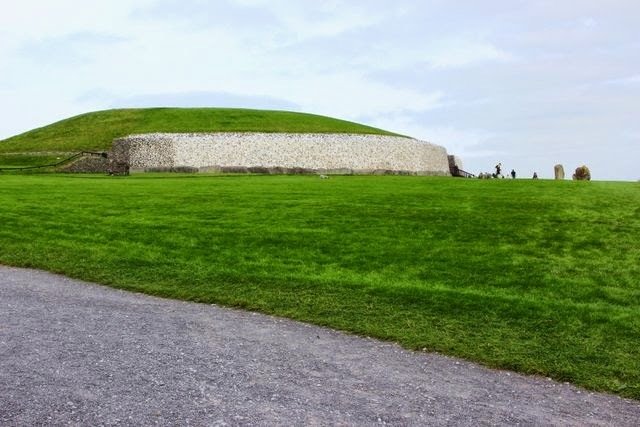 Visits to Newgrange are limited to guided tours only and then only in small groups of 25 people. I booked my tour through Newgrangetours.com. Mary Gibbons was an excellent tour guide, and her coach tours have a guaranteed tour time which means no standing in line. 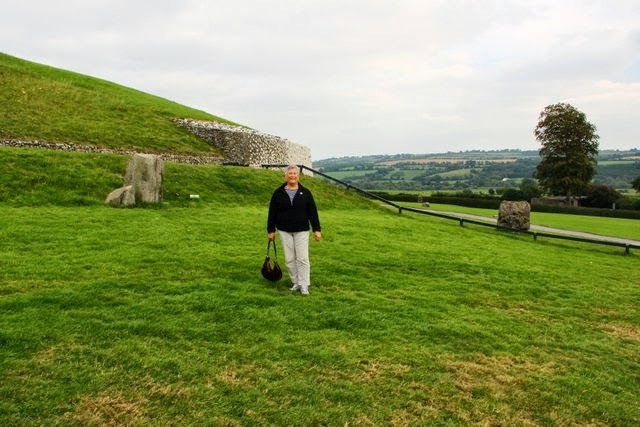 I highly recommend her tour if you visit Newgrange. Originally excavated and restored in the 1970's, the entrance is a bit more 'polished' than current archaeological sites would be. Ducking under a large stone slab, you enter the darkness of a narrow passage. In some places, it's necessary to slither between stones sideways as you walk the 19 meters to the burial chamber. The chamber itself is ringed with 3 alcoves, each big enough to hold 2 or 3 people. Our group of 25 was just able to squeeze into the main chamber...it's not very big compared to the huge mound over and around it. It's thought that the small alcoves were the burial areas for the cremated remains of ancient kings or warriors. The rectangular window above the mound's entrance is a light window. On the days around the winter solstice, Dec. 19th -23rd, the light of the rising sun shines through this window, illuminating the passage and the alcoves. 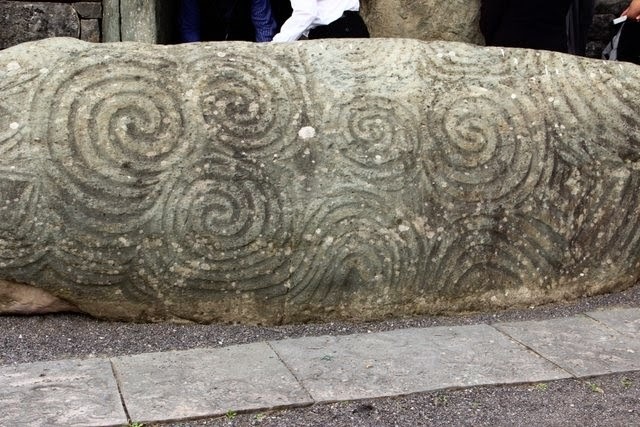 The mounds at Knowth and Douth have similar celestial alignments. 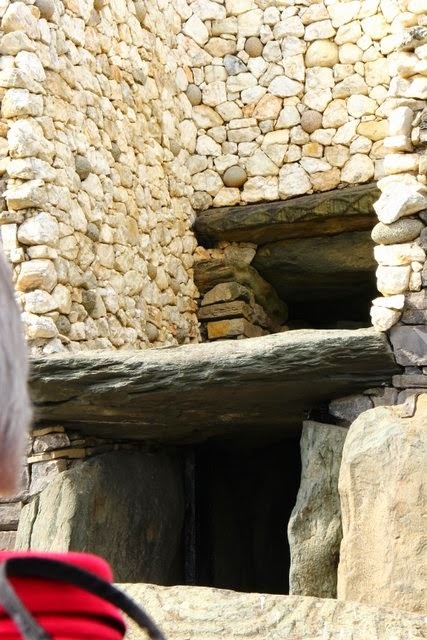 Our guide pointed out the high corbelled stone roof of the burial chamber. It has stood intact for over 5,000 years with no evidence at all of leaking. A pretty amazing building feat, I'd say. The mound is ringed with a base of 97 huge stone slabs called kerbstones. 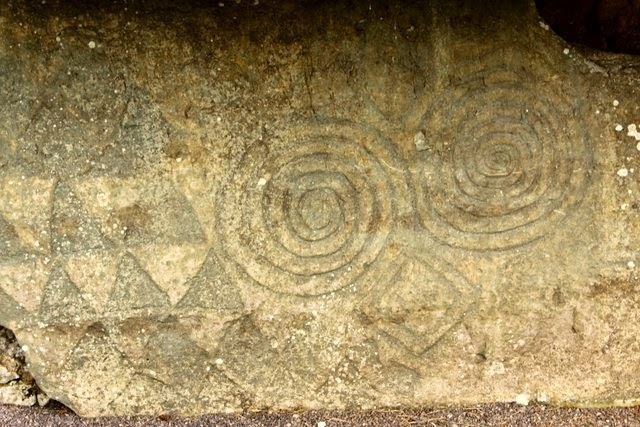 Seventy of these have been excavated, and 39 of those are decorated with these Neolithic symbols. No one knows what they mean; you're free to make up your own interpretation of them. as well as the living! A nice Japanese man took my photo at the mound.